Now FREE with Your Donation of Any Amount! My name is Ameerah Lewis, and I'm the founder of The Hem of His Garment Bible Studies. When God gave me a vision for The Hem, I had no idea that He planned to use it in such a powerful way. Well over 50,000 people come to The Hem every single month, searching for answers to life's many questions. We offer them hope, because we offer them God's truth. "I thank God for your obedience for your teachings have been a total blessing to me and my family." "Praise and thank GOD for you, Ameerah! I am so hungry and thirsty for the LORD! This is so timely for me. GOD's blessing to you, your family and ministry as you are willing to be used by the LORD to touch lives and draw people to HIM!" "You are truly a blessing and God is using you. I discovered you, because of a prompt from the Holy Spirit that made me search google. The name hem of his garment, clicked for me, because it symbolises so much humility." The Hem offers Bible studies, Christian email classes, monthly devotions and even a monthly audio class, all for free. Believe it or not, to keep The Hem up and running costs my family thousands of dollars each year. 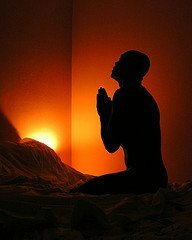 Please partner with us to reach the people from India to Pakistan who are secretly searching the internet for more of God. For your donation of any amount, I want to give you The Hem's entire Becoming God's Masterpiece Home Study Program for free! Today's YOUR Day To Break Free! You know, it doesn't matter who you are, what you've done, or what your life experiences have been - Your Heavenly Father wants to have a special and transformational relationship with YOU. One where, in the stillness of your time together, He can gather all of your broken pieces, and reshape you into His very own masterpiece. That is the kind of relationship that God was drawing me to just a few years ago. And that is the kind of relationship that you can start building TODAY through The Hem's Intensive Bible Study Program! Press Play for a message from the Bible study book's author. Feel Like There Are Walls Separating You From God? You are not alone! In fact, most Christians secretly feel like something is keeping them from connecting to God - They just can't figure out what it is! This 10 Week Intensive Bible Study Program will take you through the most common road blocks that stop Christians from truly connecting to God. Then, you will break down those road blocks, 1-by-1, once and for all! No longer do you have to feel distant from your Heavenly Father! You'll discover how to invite Him into every area of your life. Then, He will begin mending your broken places, and shaping you into His own work of art. Learn How To Break Down The Walls Separating You From Your Heavenly Father! Find out why Satan doesn't want you to feel forgiven (Week 8). Learn about the true character of God, His desires for you and for your destiny in Him (Week 3). 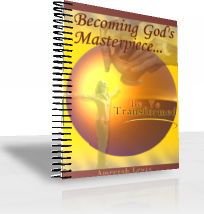 Your Becoming God's Masterpiece Bible Study Workbook. 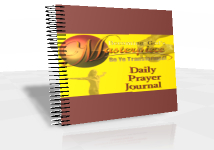 Your Daily Prayer Journal with 60 insightful prayer prompts. The Why Forgive eBook by Johann Arnold. *You will have immediate access to your eBooks via email once your order is complete. All eBooks are in PDF Format. Start Becoming God's Masterpiece Today! I really pray that you are blessed by the Becoming God's Masterpiece Bible Study Program! I truly believe in my heart that God shared these truths with me so that He could use them to transform your life in a very special way! P.S. 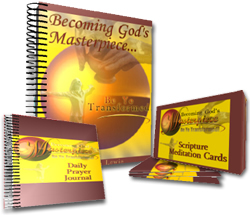 For less than the price of a DVD - Just $12.95 -Now FREE with Your Donation of Any Amount- you can invite God into your life to begin transforming you into His very own work of art! *The Becoming God's Masterpiece Bible Study Workbook features exclusive lessons that will revitalize your Christian walk, plus never seen before expanded editions of my most popular Bible lessons from The Hem Bible Studies!